Brock Nelson made sure the playoff-bound New York Islanders still control their destiny in the final game of the season. "I've been high on it (home ice) all year, but it's not going to matter," coach Barry Trotz said. "You look at our record home and away, they're almost identical. We don't change the way we play on the road, at home. Would we like home-ice advantage? Yes, we would for our fans." "He was outstanding in the shootout against them, pretty dynamic people," Trotz said. "He was really good." "He (Montembeault) played amazing. 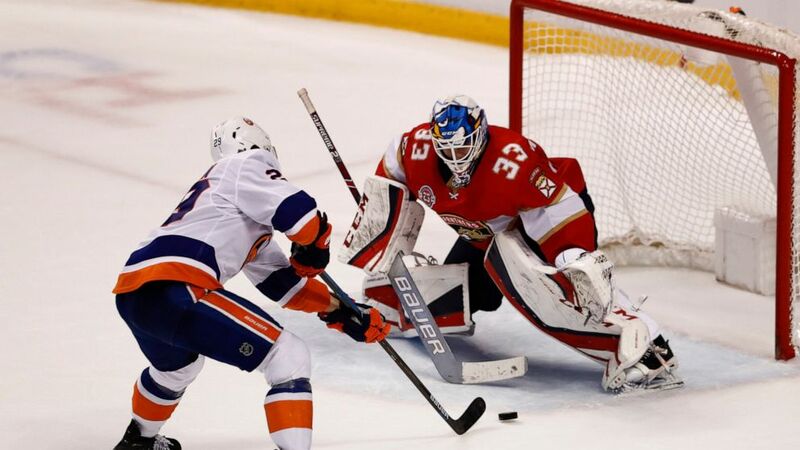 He gave us a chance," Panthers coach Bob Boughner said." He held us in there and gave us a chance to eventually get the point and almost two. I thought he and Greiss were two of the best players on the ice." "I thought we did a really good job tonight, played a good game," Nelson said. "Greiss made a lot of saves, four big ones in the shootout. Big for us to come down here, get this one and now on to the next one with another big test to finish it off." Huberdeau tied it on the power play as his shot from the slot trickled between Greiss's pads for his 29th goal and 90th point of the season. "It's nice, a career-high in points," Huberdeau said. "It's a good year, but I'd rather have 60 points and make the playoffs."